In case you are wondering what these measurements are, they are pointers to a new dimension in landscaping: This is an order for 1,300 fullygrown Royal palms (Botanical name Roystonea regia). 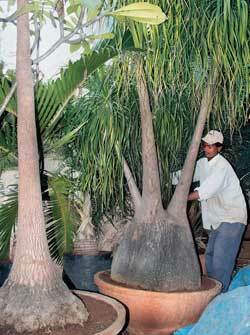 At their current price, this Royal palm order will be worth a cool Rs 26 lakh. Now picture this. At the new international airport in Hyderabad, five gigantic banyan trees (Ficus bengalensis) stand tall amidst the frenetic construction activity. All the trees have one thing in common: they have been transplanted at the airport all the way from Kamareddy, little over 100 km from Hyderabad on the Hyderabad-Nagpur highway. The airport, which is expected to be up and running by March 2008, is now in the process of planting palm and other big trees spread across 500-odd acres earmarked for landscaping (of a total area of 5,500 acres). The GMR Group, which is building the airport, is also replanting trees uprooted as part of a road widening exercise, as was the case with the banyan trees. And, GMR is not alone. “Over the last two to three years, probably driven by the growth of IT and other industries, and increased buying power, one can notice an increased demand for instant gardens,” says S. Geetha Reddy, Assistant Director, Horticulture, Government of Andhra Pradesh. “In fact, people have become very specific in their choice,” says M.M. Hussain (Vakeel to his customers and friends), who runs Plants Land nursery, citing the order for 1,300 Royal Palms (though, he is quick to add that while the clarity in demand is quite common, such huge orders are still not very frequent). Another case in point is L&T’s housing project at Gachibowli in Hyderabad that has almost perfected the art of re-planting grown-up trees. In the last one year, it has re-planted 500 trees and will add 4,500 more by August 2009 when the project is completed. The trees here include varieties like Palms and ‘Ficus Twisted’. “We wanted to provide instant forestation and green ambience to people residing here,” says B.N. Ravi, Deputy General Manager, L&T Housing Project (Serene County), spread over 31 acres. The landscaping on a total area of 10 acres involves investment of about Rs 4.5 crore. The scene is no different at theIVRCL Group’s housing project Hill Ridge Springs, again in Gachibowli and right next to the Indian School of Business. It has planted seven date palms (each around five to 10 years old) around its pool. “We wanted to give a readymade ambience to the people using the pool,” says E. Sunil Reddy, Managing Director, IVR Prime Urban Developers. Planted about 30 months ago, the trees have adapted fast and have even started bearing fruit. All of this, of course, came at a price of around Rs 7,000 apiece. “Other than providing the ambience, we also saw it as a useful experiment for our future ventures as this will now help us re-plant trees that could get uprooted,” says Reddy. While the joy of possessing an aged tree is quite evident, the process of planting it is serious business. “It is not very easy and requires very careful handling,” cautions N. Chandra Mohan Reddy, Officer on Special Duty, Buddha Purnima Project Authority of HUDA (Hyderabad Urban Development Authority). The re-planting process is anything but ‘a quick cut and replant’. Typically, it starts with thepruning of higher branches (called the crown portion) to ensure safe transportation.